Remember the Harper government’s attack on progressive charities? Well, it looks like Canadian conservatives are gearing up for Round 2. Last week, Former Finance Minister Joe Oliver used his column in the Financial Post to complain about donations by American organizations to Canadian non-profits. This week, a complaint filed with Elections Canada by a group called Canada Decides is alleging “foreign influence” in the 2015 federal election, even claiming that progressive organization Leadnow was “spawned” by foreign money. The group, fronted by former Conservative MP Joan Crockatt, also includes two other directors: Brent Chapman the husband of former CPC MP Kerry-Lynne Findlay and Chad Hallman, a conservative campus activist and U of T undergraduate. 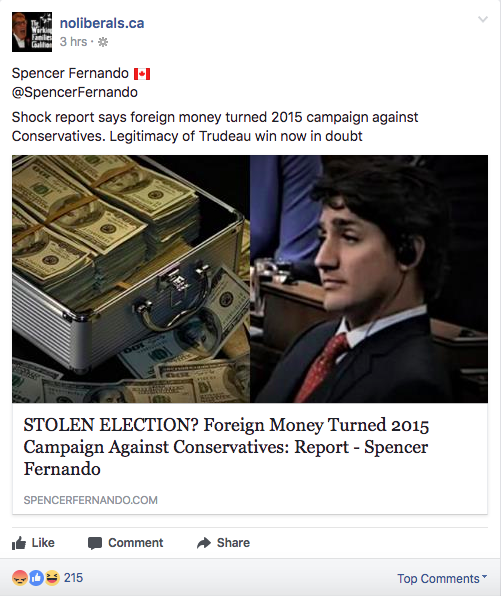 Chapman’s Facebook page appears to regularly promote right wing conspiracy theories about open borders and the funding of third party groups in Canada. The complaint, yet to be investigated and still unproven, has already started to spread throughout the right wing blogosphere in typical fake news fashion. 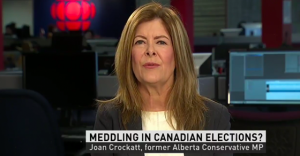 For her part, Crockatt has been regularly taking to Twitter to complain about “foreign influence” in Canadian elections. Liberals make self-serving change to the Elections Act but IGNORE the huge foreign influence in the 2015 election? Stand up @karinagould!! In his recent column Oliver also invoked the spectre of shadowy foreign governments and interests, citing “third parties…from L.A. or Moscow”. Of course, when it comes to conservatives conflating environmental and other progressive groups with sinister foreign powers, we’ve seen this movie before. Indeed, this rhetoric is eerily reminiscent of the very language Oliver used in 2012 when, as Natural Resources Minister, he claimed “environmental and other radical groups” campaigning on green issues were “threatening to hijack our regulatory system to achieve their radical ideological agenda”. The Conservative government then proceeded to launch audits of a number of progressive charities, ignoring right wing groups entirely. Most British Columbians think it’s time for Christy Clark to go. 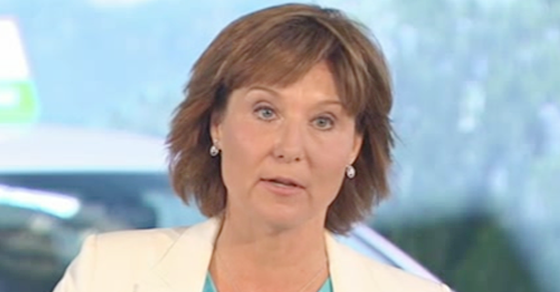 While exit polls from election night showed three in five voters wanted a change in government, a fresh poll from Mainstreet Research for Postmedia suggests an overwhelming majority of BC Green supporters don’t want their party keeping Clark’s scandal-ridden BC Liberals in power.